I’ve always been drawn to the element of water. A small stream or quiet pond will draw my eyes and make me pause for a second to admire its beauty. The weeping rock at Zion National Park really had me mesmerized. So can you imagine three days surrounded by the most turquoise water and multiple gorgeous waterfalls? The Havasupai Reservation was a dream. Below is a full itinerary of our trip (three days) so you can learn what to expect. Or, click here for tips on planning your own trip! My boyfriend and I flew into Las Vegas after work so it was late when we landed. We spared no time jumping in our car, grabbing a coffee at Grouchy John’s and hitting the road. After a 2.5 hour drive, we checked into Hualapai Lodge for a last night in a soft bed. I originally planned to stay at the trail head, but I am SO glad we didn’t sleep in the car. Staying at the lodge allowed us to get a good night’s sleep and spread out to pack our camping gear. I would highly recommend this – worth the $99. After researching Havasupai for months before the trip, I knew I wanted to make the most of our time there. So we were up before the sun to make the 1.5 hour drive to the hilltop and start on the trail early. I typed “Havasupai Trailhead” into Google Maps and got there with no trouble. Watch out for animals in the road! We ended up getting there a little later than I wanted, about 7 a.m.
We started from the Havasupai trail head around 7 a.m. and made a few friends along the way. The trek down is 10 miles, mostly downhill and flat. Eager to jump in the bright blue waters, we booked it down the trail in about 4 hours only taking two breaks. One was at the tourist office where you check in, show your reservation print out and get your wrist band. From the office, it’s another two miles to the campground. The first sight of Havasu Falls will be from above and is such a magical moment seeing it for the first time. So close… keep going toward the campground! The campsites are first come, first serve. Keep exploring past the fern spring for campsites. We were so happy with our site across the creek! After setting up our tent, we made lunch and headed over to Havasu Falls. It was around noon and the falls were in the shade, but some of the pools still had great sun. We spent a few hours enjoying the chilly water and views. After a long day, we made a quick dinner, settled into our tent, fell fast asleep and were up at 3 a.m. to practice with some night photography. I brought a tripod just to practice these shots. They turned out OK and it was worth the extra weight . Havasu Falls and the night sky at 3 a.m. If you make the trip, I urge you to take the time and effort to hike to Mooney and Beaver Falls! We were up at 6 a.m. to start our eight mile (each way) trip to Beaver Falls. To Mooney Falls, continue to the end of the campground and keep following the trail. You’ll see the waterfall from above and it’s quite the sight! Now follow the trail down to the waterfall. You’ll see a sign that says “Descend at Your Own Risk.” This is where we lost the trail and wandered around a bit. I finally noticed a white arrow painted on the rock and pointing down into a tunnel. Look for the arrow pictured below… this is where the fun begins! Now you start the exciting descent to Mooney with metal chains and wooden ladders as your aides. If you’re new to hiking or afraid of heights, it can be intimidating, but I promise it was SO fun! Just take your time and remember that the climb up is easier than the climb down. I am so thankful that the reservation has maintained the way down so visitors can experience the falls. Once down, you’ll admire the beauty of Mooney Falls and feel so accomplished you made it down alive. Get ready to get soaked in mist from the sheer power of this falls! The falls was in the shade allowing us to have fun with the tripod and long exposures here too. We continued to the trail to Beaver Falls. The trail splits several times, but as long as you’re on the clearly marked trail, it will take you to the right place. Then you’ll come to your first creek crossing. I changed from my hiking boots to my water shoes and rolled up my pants. Keep your water shoes on after the first creek crossing, because there’s another shortly after that. After the second one, you can put your hiking shoes back on because you’ll hike for a while before the next creek crossing. Or, you can just wear your water shoes the entire time. I saw many hikers doing this, but I didn’t want to risk getting blisters. This hike was so fun! You’ll run into a palm tree at the bottom of the Grand Canyon. How cool is that? This is when you know you’re getting close. There’s a few ladders up and then you’ll have a view of Beaver Falls! Continue down to have access to the water and enjoy the hard earned dip in the cool water. We arrived around noon and had plenty of sun for swimming and a snack. This was the best falls to swim in! 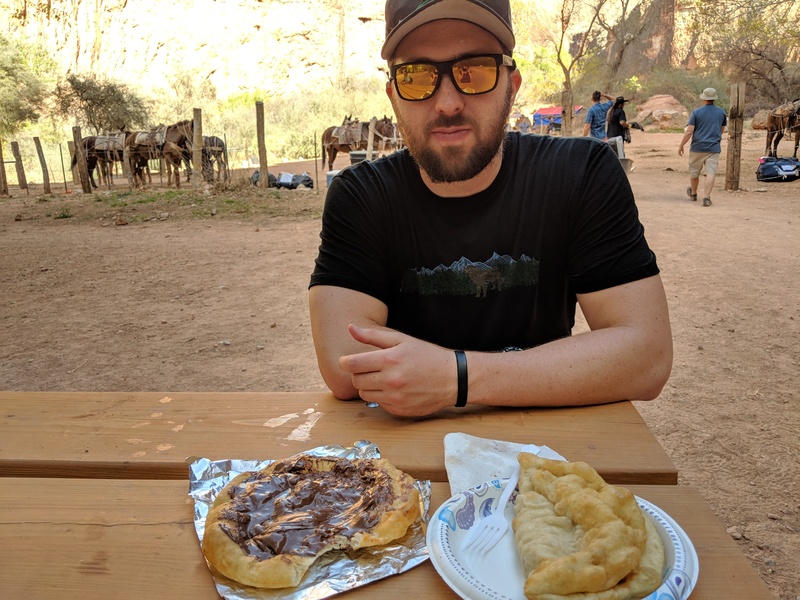 When we made it back to camp, we enjoyed fry bread at the hut near the ranger’s station – this was just our appetizer before a meal at camp! Bring cash on your trip, because this was SO good after a 16+ mile day. I didn’t want to leave, but we made breakfast and packed up camp early. Then we carried all our crap on our backs UP the canyon for 10 miles. Honestly, it was harder than I thought it would be. It’s flat for most of the way, until you get to the switchbacks that we had just bolted down 48 hours earlier. The switchbacks were in the sun by the time we got there which made for a tiring trek. We took several breaks. This was 70 degrees in the beginning of April. How do people do this in the summer? We made it up in about 5 hours and were exhausted and dirty. Again, worth it. We found our car, switched to flip flops and started the drive back to Vegas. We stopped for Taco Bell on the way and of course, Grouchy John’s coffee again. We stayed at the Westgate Hotel off the strip (it was just meh..). Bonus tip… after taking a much needed shower, we walked to Lotus of Siam (thanks to Anthony Bourdain) for AMAZING Thai food. Then we were up at 4 a.m. to make a 6 a.m. flight home. The trip flew by but I LOVED every single second. I would love to go back to the Havasupai Reservation one day! Plan your own trip to Havasupai – check out 13 Things I Wish I Knew Before Visiting Havasu Falls! Click here for my complete packing list! New to backpacking? Check out my training guide! The falls are 10 miles into the Grand Canyon in Supai, Arizona and are part of the Havasupai Native American Reservation. You MUST make reservations for at least one night to visit as a tourist, though I recommend two or three nights! Plan ahead, and book in advance. I counted down until the 2018 reservations opened (Feb. 1 at 9 a.m.) and booked within minutes. This is the way to do it if you want to make it to the campground and falls. Check the website for details on how. Be prepared to spend more than your usual camping reservation, but know that it’s worth every penny. Check the website for the most up to date costs. How to get there: fly into Las Vegas, Nevada or Phoenix, Arizona and drive about four hours. We rented a car in Vegas, grabbed last minute snacks and camp stove fuel at Walmart, and stayed the night at Hualaupai Lodge. We chose to stay in a hotel instead of the car so we could pack our packs and get a good night’s rest. The hotel was about 1.5 hours from the trail head (I used the “Havasupai Trailhead” destination in Google Maps as my guide). Some hikers will sleep in their cars at the trail head to get an early start. It’s not always about the destination. The 10 mile journey through the Grand Canyon was also magnificent. Did I say it was 10 miles? From the trail head, it’s approximately eight miles to the Havasupai village and another two to the campground. It’s all downhill one way and up the way back (steep for the first mile or two, then very gradual for the rest of the trek). Took us about 3.5 hours down and 5 hours up. It’s not necessarily a “hard” hike, but will take some endurance, snacks and water! We went in the early Spring and still got hot and tired on the way back up. Please consider the season and temperature when planning your water and food needs. There are mule and helicopter options that you can learn more about on the official website. However, the experience and effort of the hike made this trip so special. Check out my five tips for preparing for a backpacking hike. So, be prepared to pack light and carry everything on your back (including your trash)! Click here to see my complete packing list! There’s drinking water at the campsite. Leave the water filters and extra water at home. I filled up with everything I needed for the hike down (1.5 liters) and up (3 liters) and used the spring for the rest of my time there. Nice, cool and refreshing water! We filled up our water bottles and bladders with fresh spring water at the campground. Havasu Falls isn’t all! Havasu Falls is conveniently near the campground and oh-so-gorgeous, but you’ll regret not exploring further! Mooney Falls is just past the campground, but a steep climb down the side of the cliff with the assistance of chains and ladders. It was a blast! From Mooney Falls, it’s another three miles to Beaver Falls (pictured below). Protip: try to get to Beaver Falls around noon while it’s in the sunshine! This hike was so fun and relaxing with a very refreshing treat of gorgeous falls and pools at the end! We hiked more than 30 miles in our three days in Havasupai. Read more about the hikes here! We waited until some of the crowd cleared and posed for the tripod at Beaver Falls. Take some cash and try the fry bread! There are vendors selling fry bread at the entrance of the campsite. There are several ways to top your fry bread: taco, chili dog, Nutella, etc. It’s like a mix of funnel cake and pizza crust and so worth the $12 cash for a filling snack after a long hike! We had this a treat on the second day, but I’ve heard of other hikers making meals out of this and packing light on their own food. Nutella and bean and cheese fry bread for a snack at the campground. Bring your camera, or borrow one! Around every corner is a gorgeous view. This gorgeous land has reignited my love for playing with photography. I experimented with long exposures and woke up at 3 a.m. for a starry night shot. For me, it was half the fun of this trip! Don’t leave without taking a dip! I hear the water is a steady 70 degrees Fahrenheit year round. In late March, that was chilly, but refreshing. It’s not too bad when you’re in the sunshine and was great for helping my leg muscles recover after a long hike. Check out the itinerary of my recent trip here. What to pack? 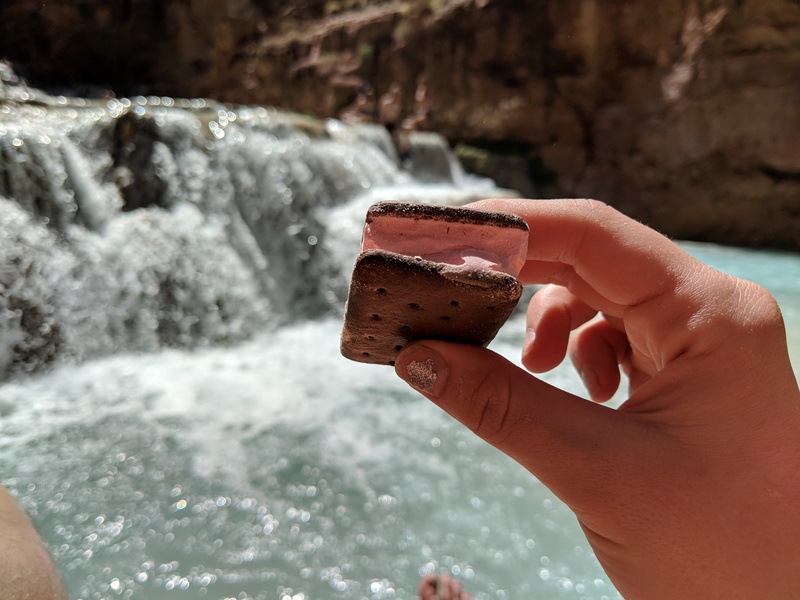 See my complete list for Havasupai!